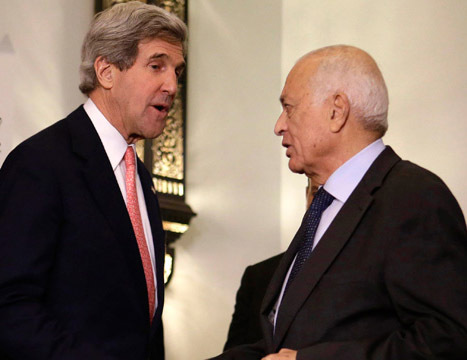 Secretary Kerry Salutes Dr. Nabil El-Arabi Secretary General of the Arab league at his official Arab league delegation on Peace Process and Palestinean-Israeli conflict.. Under the chairmanship of HE the Prime Minister and Foreign Minister Sheikh Hamad bin Jassim bin Jabor Al Thani, who is also Chairman of the Ministerial Committee for Arab Peace Initiative, and with the attendance of Arab League Secretary-General Nabil Elaraby, the Committee held a consultative meeting last night in the US capital, Washington. During the meeting, they discussed the latest developments of the Arab initiative and the efforts exerted by the Peace Initiative Committee under the chairmanship of the State of Qatar; in addition to the coordination mechanisms and concerted efforts to crystallize a joint and unified Arab position aiming at activating the peace process in order to reach a comprehensive and lasting peace settlement to the Palestinian issue, before the meeting with US Secretary of State John Kerry on Monday. Talks during the meeting also dealt with the latest developments in the Palestinian cause and the joint Arab-Palestinian steps to be taken in the next phase. 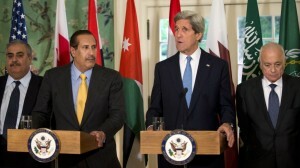 Secretary of State John Kerry and Qatari Prime Minister Sheikh Hamad bin Jassim bin Jabr Al Thani Press Conference After Meeting with Arab League Officials April 29, 2013 Blair House Washington, D.C.
SECRETARY KERRY: Thank you very much. Good afternoon, and thank you for being patient. I am honored to be here with Sheikh Hamad bin Jassim Al Thani, the Prime Minister of Qatar, with the Secretary General Nabil Elaraby of the Arab League, and with a group of foreign ministers, ambassadors who are representing their countries, all of whom are here on behalf of the Arab League, which specifically set out to come here with a purpose. And we’re very honored by their presence. The Vice President of the United States joined us for a good period of the meeting in order to share thoughts with this delegation, and I think we’ve had a very positive, very constructive discussion in the course of the afternoon with positive results. During the course of those discussions, on behalf of the President of the United States, I underscored the Arab League’s very important role that it is playing and has determined to play in bringing about a peace to the Middle East and specifically by reaffirming the Arab Peace Initiative here this afternoon with a view to ending the conflict. On behalf of the President, I reaffirmed, as did the Vice President, the U.S. commitment to pursue an end to the conflict based on the vision that President Obama outlined in May of 2011: two states living side by side in peace and security brought about through direct negotiations between the parties. The U.S. and Arab League delegation here this afternoon agreed that peace between Israelis and Palestinians would advance security, prosperity, and stability in the Middle East. And that is a common interest for the region and the whole world. The U.S. and Arab League delegations this afternoon also agreed about the importance of this particular dialogue, and so we agreed to continue consultations on a regular basis and to meet as a group as needed in order to try to advance the efforts towards peace and an end to the conflict. PRIME MINISTER HAMAD: Thank you, Mr. Secretary. First of all, in my behalf and the Arab delegation and the Secretary General, we thank you very much for this meeting and we thank the Vice President for giving us your valued and his valued time. I think it was a very productive and good meeting to start with, and I would like to say that the Arab League delegation understands that peace between the Palestinian and the Israeli, is starting – it’s a strategic choice for the Arab state, referring to the Arab Initiative, Peace Initiative – as sound peace for reaching a joint justice and peace between the Palestinian and the Israeli, and stability in the Middle East. 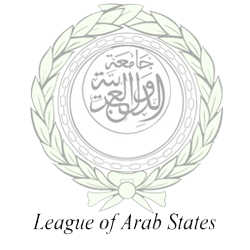 The Arab League delegation affirmed that agreement should be based on the two-state solution on the basis of the 4th of June 1967 line, with the possible of comparable and mutual agreed minor swap of the land. The Arab League delegation expresses its thanks and for the President Obama and for yourself, Mr. Secretary, for your efforts and your commitment for the peace, and also endorses President Mahmoud Abbas’ effort for the peace. The delegation expresses support for efforts for the economic help and aid between the Palestinian, and from the – for the Palestinian – and we all think that we should work together to find a sound economical package to help the Palestinian state. Thank you very much. 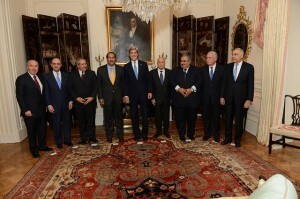 SECRETARY KERRY: Thank you very much, Mr. Prime Minister. So on that note, folks, we want these comments about the Arab Peace Initiative and their commitment, their reaffirmation to it, as well as their commitment to the Palestinian Authority and economic initiatives to stand on their own. And I think Jen Psaki will be happy to give you a readout further. So I’m very grateful to all of these ministers for traveling this distance, for being here today. This is going to be an ongoing dialogue, an ongoing process, and we look forward to continuing to work together. And it’s been very, very productive. Thank you very much. QUESTION: Did you talk about Syria at all? 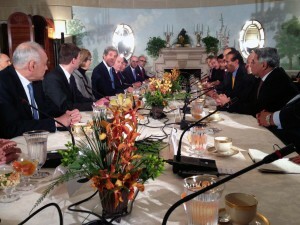 PRIME MINISTER HAMAD: Yes, we talked about Syria. I think all of us supporting the last declaration from Istanbul, and there is something here will be given to the press about that. Thank you very much, John. Thank you.